Ever worn any makeup? Used something for chapped lips? Polished your shoes? Chewed gum? Candelilla Plant ~ Young plants usually grow into single bunches like this one. If so, you’ve probably used a natural product of the Chihuahuan desert, Candelilla wax. Candelilla wax comes from the Candelilla plant, a small succulent that grows in bunches and looks like it’s all stems. The plant usually has a bluish-white cast to it and is rarely more than a couple of feet high. It grows throughout the Chihuahuan desert, but your best chance of seeing it is in Big Bend National Park or the Big Bend State Ranch where it is protected from exploitation. 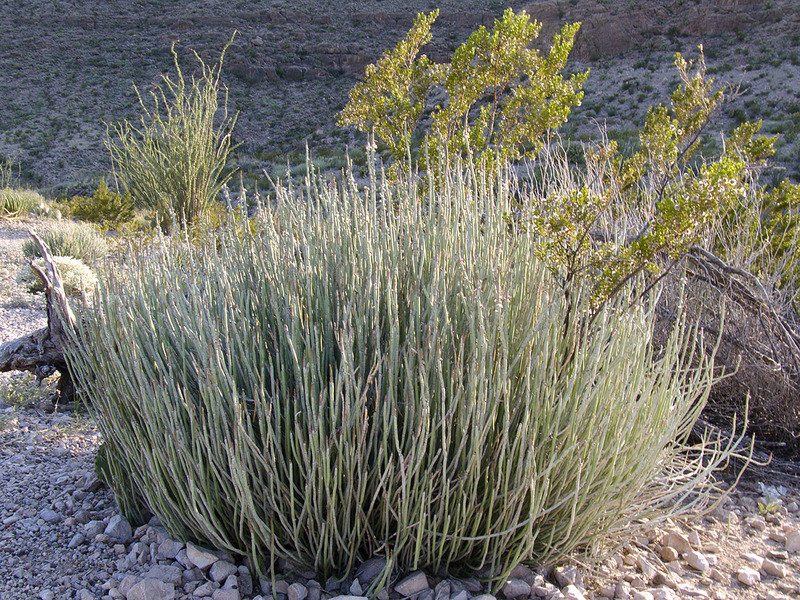 Candelilla is a true desert plant, preferring hot, dry conditions and well-drained calciferous soils. Young plants grow in single clumps. The leaves are so tiny, and last such a short time, you are not likely to ever see them at all. But the stems produce more than enough food to maintain the plant and help it grow. 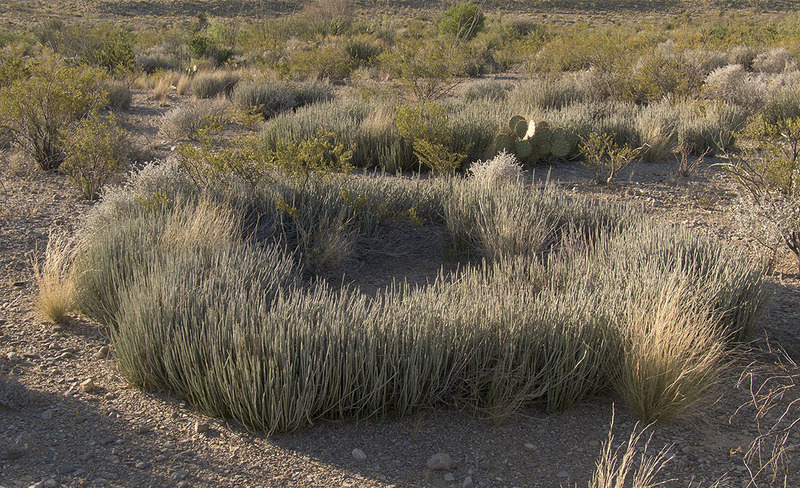 As stands of Candelilla become more established, the plants frequently grow into large circular patterns like giant donuts. 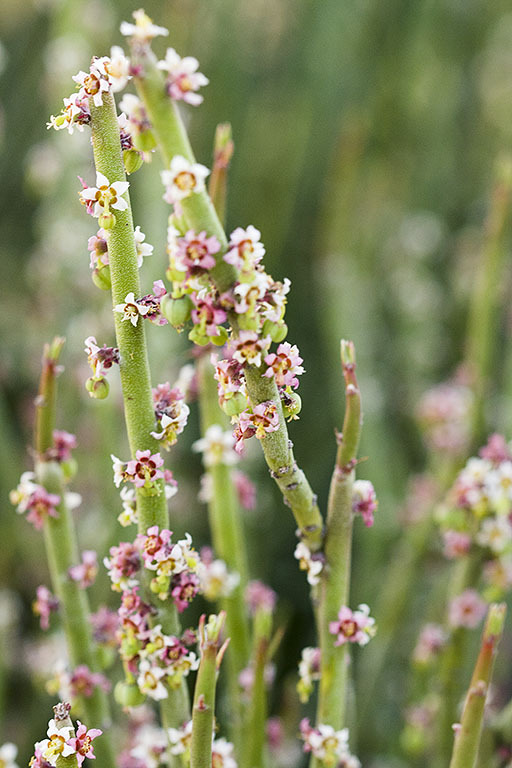 Candelilla protects itself and conserves moisture by coating its stems with a fine, hard wax. The wax has so many unique properties, it is probably the most useful substance on the American continent that is extracted entirely from wild plants. You can see Blossoms, Seeds, and the Fine White Wax Scales in this photo. The chewing gum industry is the biggest consumer of candelilla wax, followed closely by the cosmetic industry, but more than 20 other industries depend on it. Candelilla wax is used in polishes, adhesives, anti-corrosives, plastics, matches, integrated circuit boards, lubricants and precision molding applications. Although Candelilla is easy to grow, cultivated plants don’t produce much wax. The best wax comes from plants in the wild. To get the wax, workers, known as candelilleros, gather the plant from the wild. Because it takes about 50 pounds of Candelilla plant to make a pound of wax, candelilleros do the first processing in the field, boiling the plants in a mixture of water and sulphuric acid. Boiling releases the wax which floats to the surface where it is collected and dried. By doing the first processing, candelilleros can carry much more wax to market than they could if they were just transporting the plants themselves. To protect the plant from extinction, the Mexican government requires that all candelilla wax be sold to government cartels. But the government doesn’t pay well, so many candelilleros prefer to smuggle the wax to American buyers. On the other hand, Candelilla populations have become greatly reduced in Mexico, but supplies are abundant in the US where the plant enjoys federal protections. Naturally, the great quantities of Candelilla on the north side of the border encourages smugglers to transport the plant across the border for processing. The peculiar result of this situation is that Candelilla may be smuggled into Mexico, while its finished product is smuggled into the US. In fact, Candelilla may be the only agricultural product that is smuggled from the US into Mexico! Candelilla’s future is probably secure despite its current exploitation. The plant doesn’t produce much wax during wet years, so supplies are unreliable. This situation encourages industry to develop alternatives to Candelilla wax, and indeed demand for the product is declining. The simple beauty of the plant is also helping protect it. In cultivation, Candelilla tends to become a translucent, light green. Its unique shape forms a nice contrast to many other plants in a xeric landscape and, of course, the fact that it’s almost impossible to kill encourages even “black-thumb-of-death” gardeners to try it. The extreme East side and the extreme West side of Big Bend are the best places to see this plant in its native habitat. The easiest spot to reach is probably the short trail up to the scenic overlook just East of the Village campground. Candelilla is also doing well on the Mesa De Anguila and all along the Contrabando trail in the Big Bend State park near the Barton Warnock center in Lajitas. 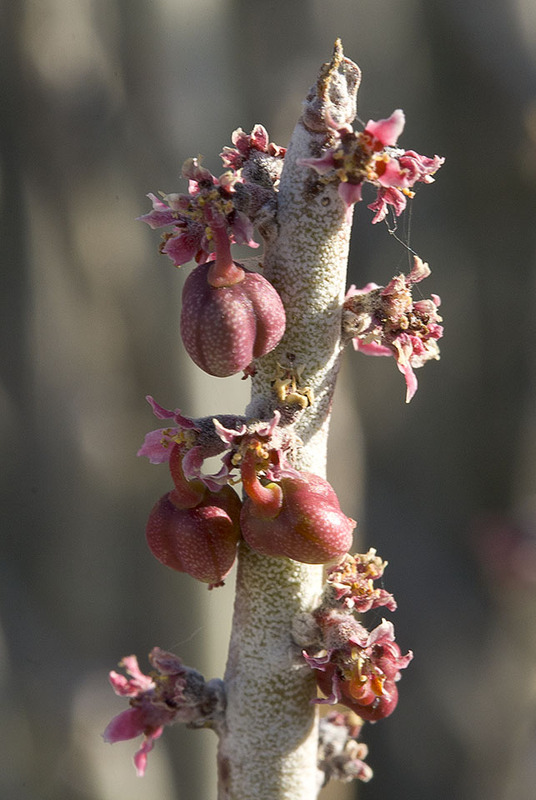 To see it bloom, look for it in early Spring, and look closely. Candelillas’ tiny blossoms repay a close look and the plant’s colorful history over the last century give it a special charm all its own. I acquired a small candelila plant last April in Zone 6 CT and it has never thrived. The stem is slowly turning brown at the base of the plant and spreading upward. Any idea what I’m doing wrong. It gets a lot of sun and I do water when it looks bone dry. I think this one’s a gonner 😦 I haven’t tried cultivating them, but most I see live in well drained, alkaline soils with FULL sun (all day). They do not seem to thrive anywhere where there is water, even infrequently, such as along dry stream beds. They love to grow on gravel plains right at the edge of steep slopes. I know that you CAN grow them. Austin city hall had them in planters in front. Really nicely written article and very information. What is the main purpose of adding Candelilla wax in Natural chicle gum and How much stock of candelilla wax is produced per year. I really don’t know why its used in gums. Perhaps to add plasticity to the mixture, and keep it from drying out (the wax forms robust films). And sadly, I don’t think anyone knows the total annual production because so much of it is smuggled into the country. Great natural resources and support. Id like to visit producing plant or ranchers next time in ft. Davis. Send to connerb@hctc.net. Thank you for posting this interesting and informative article on the candialilla plant. A couple of days ago, I joined the Big Bend Natural History Association, and purchased a copy of their delightful book, Paisanos Past, which contains the best articles that appeared in the first twenty years of the Paisano, the monthly newspaper of Big Bend National Park. 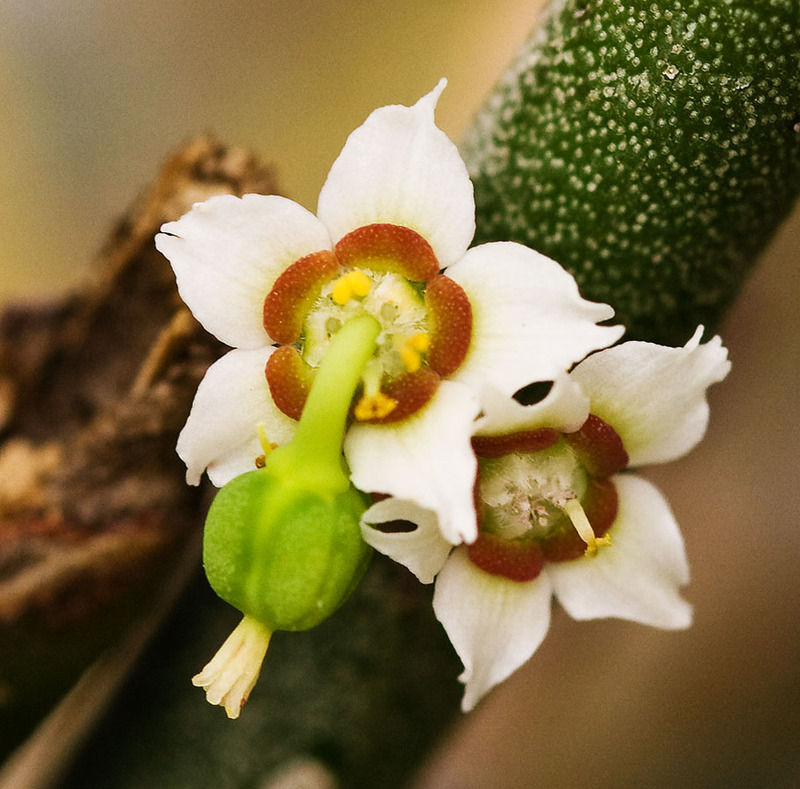 One article, “Big Bend,s Sierra del Carmen,” incuded a history of the harvesting and processing of the candalilla plant for its hard wax, which grew in great profusion on Sierra del Carmen. Also, the Sunset Western Garden Book lists candalilla and suggests its use in rock gardens and in containers. I would like to invite you to visit Candelilla Institute in Mexico: http://www.candelilla.org. You will find more information about Candelilla plant and about the industry sorrounding this valuable plant. adding your link to my blog, great information. We have a restaurant here at Lajitas called the Candelilla and since I was curious I googled it and found your blog. Nicely written article! I received a good overview of the candelilla plant–never knew anything more about it before now except that it is the source of a natural wax. I’m much more informed now–thanks!